Godard’s King Lear (1987) oscillates between being both a mess and a masterpiece. Shunning any straight-reading of the Shakespeare play, Godard, as he did throughout the 1960s, raises questions about the instability of language and the very meaning of art in a society driven by the culture industry. There is no real plot to Godard’s film and King Lear seems only cursorily interested in Shakespeare’s play, and yet Godard cultivates many of the ideas of his earlier films such as Vivre Sa Vie, Made in the U.S.A. and Pierrot Le Fou in a more coherent manner. Taking place after Chernobyl, in a world where art has been destroyed Godard traces William Shakespeare Jr. the Fifth’s attempt to recreate his ancestor’s work. If Godard shows us the breaking down of Paris in Alphaville, in King Lear the world has already been demolished and reborn. Still, even as art is being re-instantiated and reconstituted, Godard’s world is an attritional one. This manifests itself in a variety of visual set pieces, perhaps one of the most interesting being Godard himself, who appears in the film as a crazed pseudo-intellectual with audio/visual cables for hair. Speaking out of the side of his mouth while he chomps on a cigar Godard’s Professor Pluggy rattles off terse statements that sound both vacuous and philosophical. Here Godard collapses the boundaries between sciences and the humanities, between technology and literature by introducing a world that has lost its art. Pluggy’s words do generate meaning as they enable Shakespeare to “remember” original lines of long lost plays, but Pluggy also provides an interesting auto-critique. Self-reflexiveness is certainly not new for Godard, but the flippant nature of his character and the film as a whole (which begins with a recorded phone conversation between Godard and producer Menahem Golan who expresses frustration over how long the film has needed to be finished) consists of so many layers that Godard unravels the film even as it is presented to the audience. What is perhaps most startling and most impressive then, is that amidst the bric-a-brac of earlier Godard films and the brief appearances by Woody Allen and Norman Mailer, is a rather straight performance by Burgess Meredith as Don Learo. Created both by Godard and Norman Mailer, who as “The Writer” in the opening scene exclaims the only way to make Lear in the present is to “make it a gangster picture” Meredith appears to have walked into Godard’s film from another movie. As Jean Paul Belmondo and Anna Karina winked at the audience and actors such as Brigitte Bardot and Eddie Constantine played on their culturally defined type, Meredith leaves no trace of irony or self-awareness. It is this juxtaposition of the sincere and the ironic, the false and the real, the unanswerable questions and the answers for which there are no questions that permeates throughout King Lear. If before this Godard made political films and films about the capability of cinema, Lear represents an entropic investigation not just of the cinematic apparatus but of our own epistemological apparatuses. 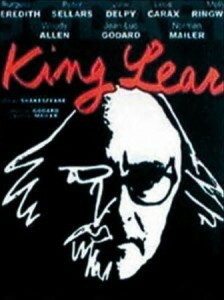 Currently King Lear is only available on DVD outside of America, although a VHS was released in the early 90s.